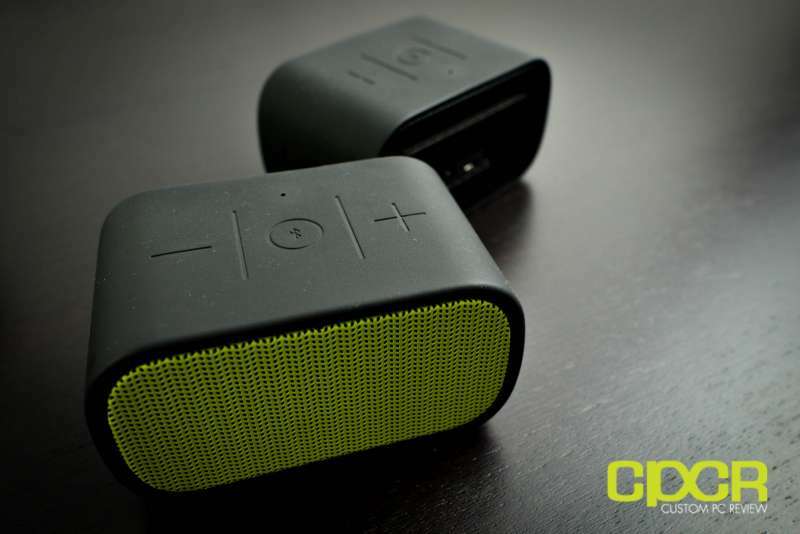 These days it seems like there isn’t a single day that goes by without some company introducing a brand new Bluetooth speaker. 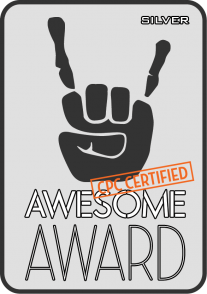 They’re practically everywhere and like it or not, even guys like Ultimate Ears (UE) who typically reside in the high end of the audio market sometimes come out to play. A couple weeks ago Logitech/Ultimate Ears asked if I was interested in checking out a brand new Bluetooth speaker they were coming out with. 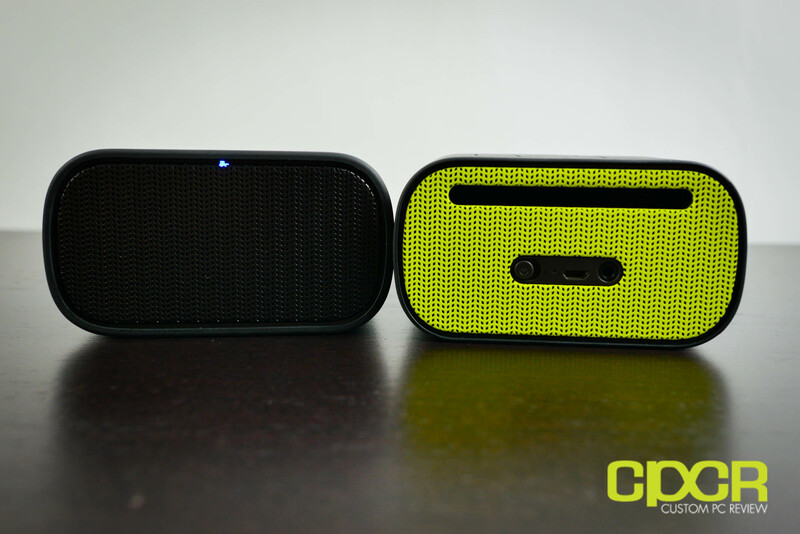 While I typically don’t accept too many Bluetooth speaker reviews since there are just so many to check out, they told me that the new speakers were quite unique as it had an ultra long battery life, could be paired up to produce a bigger, richer sound, and this thing was extremely, extremely small. Since some of these claims seemed to defy physics, it intrigued me since I”ve had plenty of great experiences with Ultimate Ears headphones in the past and if there’s any company who I felt could live up to these claims, it’d be Ultimate Ears. 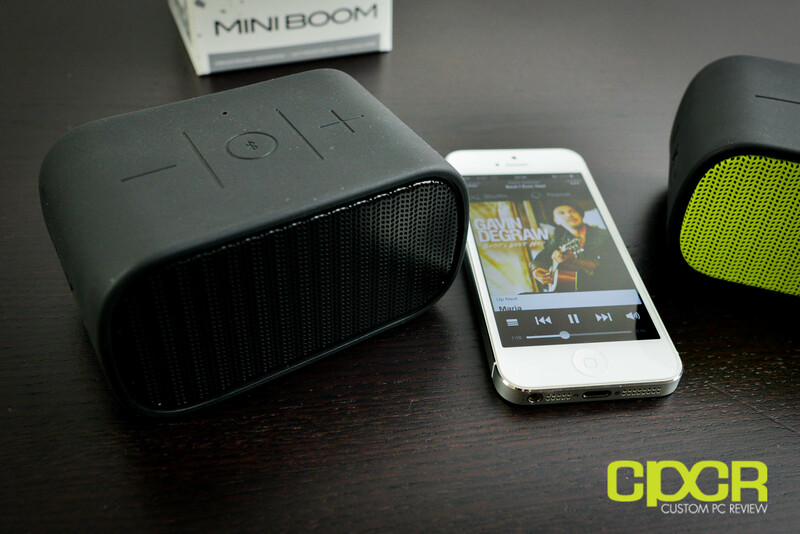 As such, today we’ll be reviewing the Logitech UE MINI BOOM Bluetooth speaker. 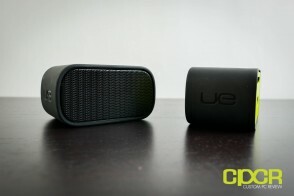 First thing you’ll notice about the UE MINI BOOM is that these guys weren’t joking around when they said it was small. 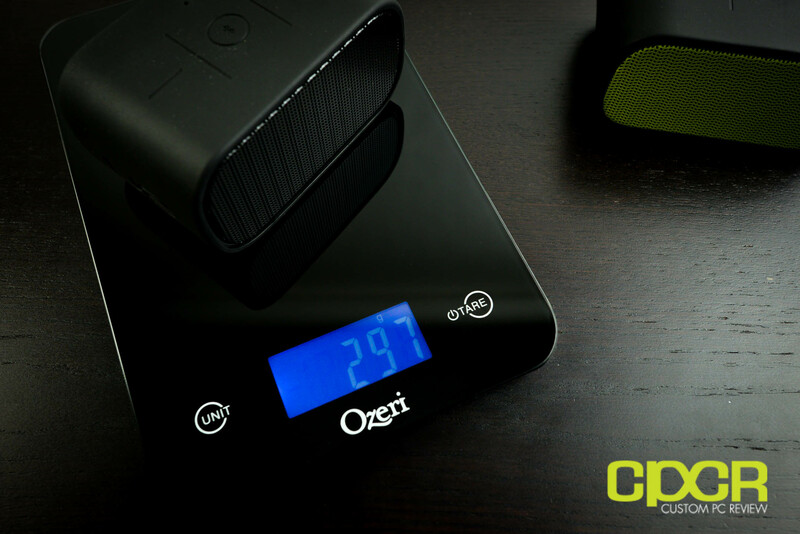 The unit itself measures in at only 4.4″ wide, 2.2″ tall and 2.4″ deep, carrying a curb weight of only 297g (~0.65lbs). That’s roughly the size of just three iPhones stacked on top of each other. The UE MINI BOOM’s design is fairly simple. There’s no bells and whistles hanging around, there’s no light show of LEDs, and there’s no elaborate setup you have to do in order to get it started. It’s simply a speaker unit enclosed in a rubber outer shell. There’s an on/off switch to turn on the unit, there’s a microUSB port to charge the unit, and there’s an aux-in to connect your non-Bluetooth devices. Once you have the unit on, there’s only really three buttons on the unit for you to worry about – volume up, volume down, and Bluetooth pair. Considering the Bluetooth pair button is only needed for pairing up new devices, there’s really only two buttons to worry about. 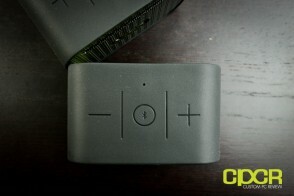 The unit can be paired either via the standard method of connecting Bluetooth devices or via NFC. The Bluetooth module onboard allows up to two devices to be connected simultaneously and up to eight devices can be stored in its memory. The UE MINI BOOM is powered by two 1.5″ drivers, which considering the 4.4″ width of the unit, are pretty much going to be right next to each other. There’s also a port in the back of the enclosure that helps add additional oomph to the low end along with a 3″ x 1.5″ passive radiator, which in theory should help reduce port turbulence and motion compression. 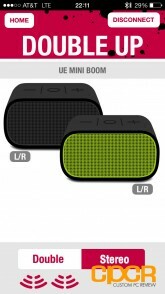 Audio quality on the UE MINI BOOM is pretty much what you’d find in typical small speakers or stuff like portable radios. With the two drivers so close to each other, there isn’t much room for audio separation and the audio tends to lack depth making everything sound a bit flat and two dimensional. For casual listening, phone calls, and podcasts, it’s not a huge deal, but it’s definitely not suited for those looking for something to really enjoy all the nuances of their music. It’s simply the laws of physics at work and Ultimate Ears unfortunately still hasn’t broken those laws yet. 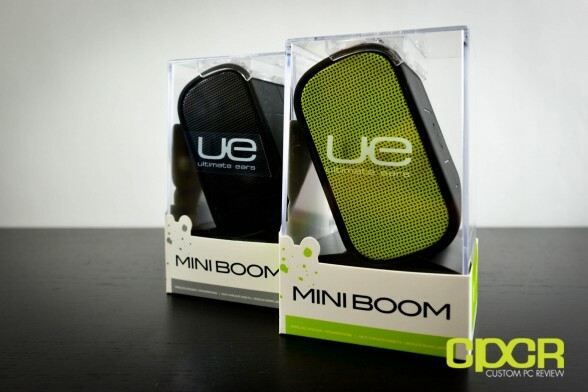 That said, the UE MINI BOOM does live up to the “Boom” part of its name as it’s capable of being quite loud especially in smaller spaces and the bass port in the back of the enclosure does help give the unit a lot of power in the low end. 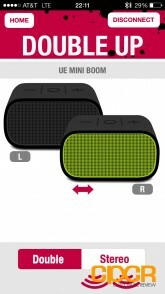 That said, the UE MINI BOOM is rated with a frequency range of 130 Hz – 20,000 Hz, so pretty much after a certain point the low end just sounds like identical thumping noises. As for the microphone, I’ve been told by a number of people I’ve called that it’s more or less comparable to the integrated unit on the iPhone. A digital microphone would’ve probably made this thing a whole lot better, but I doubt a whole lot of people are purchasing the UE MINI BOOM for its ability to act as a hands free device. Battery life on the unit is rated at around 10 hours of playback, but I’d say you can expect more around 5-8 hours depending on how many devices you have connected to the units, if the units are running in double up mode, and how loud the units are running at. I guess it would make sense that you can get 10 hours playing at low volumes with your device connected via a 3.5mm aux cable, but that’s probably the only case you’ll be able to squeeze out that much playtime. That said, it’s a fairly long battery life and those who have high capacity, quality portable battery packs such as the Patriot Fuel+ will be able to hook the UE MINI BOOMs up for all day playback. 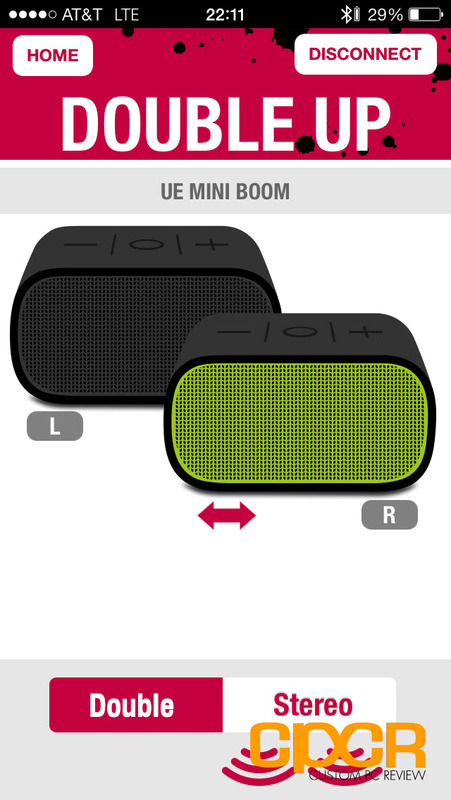 For those really looking to party, you can purchase a second UE MINI BOOM (or have one of your friends get one) and link them together in what UE calls “Double Up” mode. Double Up mode will then allow you to use the UE MINI BOOM units in either double mode, which basically syncs the audio between the two MINI BOOMs or in stereo mode, which hands left channel audio to one unit and right channel audio to another unit. What’s cool about stereo mode is that it essentially allows you space out the left and the right channel, helping create a bigger soundstage, increasing the maximum amount of aggregate volume, and making the audio sound more three dimensional. While Double Up mode is quite an awesome concept, it does come with a couple small issues. First off, you must have either the Android or iOS app. If not, then Double Up mode won’t work. There’s no button on the devices themselves that magically pair them together. Unfortunately, this guide is not readily available in the packaging and the quick start guide that is included only mentions being able to pair the speakers up using the iOS or Android apps. That said, it’s very nice to know that the UE MINI BOOMs can be paired together without using the smartphone app for those who don’t necessarily want to install it or those looking to use the speakers exclusively on the PC. Second, the devices need to be reconfigured into Double Up mode every time the units are shut off. There’s no memory, although the Bluetooth modules onboard are capable of remembering up to eight devices. Third, the volume on the two units don’t sync in stereo mode. This means if you want to adjust the volume on one MINI BOOM, you’ll have to adjust the volume manually on both units simultaneously. While this is fine in double mode, it’s a hassle in stereo mode since a louder volume on one MINI BOOM really throws off the sound. That said, these aren’t necessarily dealbreakers and most are software/firmware issues that can hopefully be fixed in future software/firmware updates. 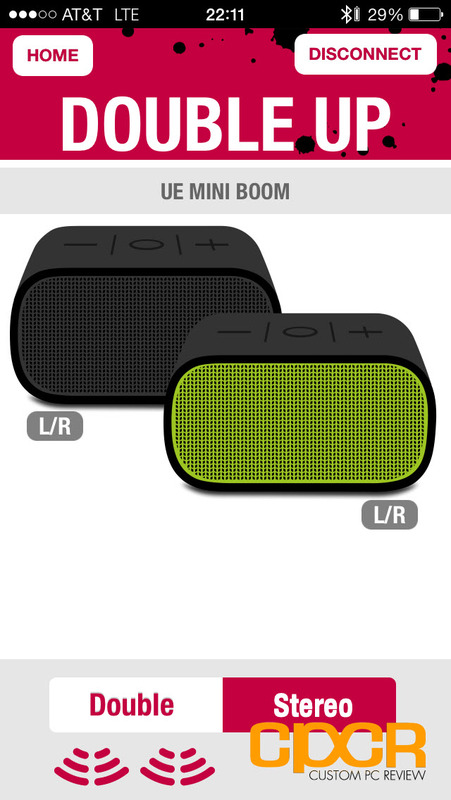 Pricing on the UE MINI BOOM is $99.99 (Amazon), and you can currently choose between red, black and yellow (although yellow looks more like green to me). For a Bluetooth speaker, the MINI BOOM is definitely one of the more expensive ones out there, but I think it’s worth considering. 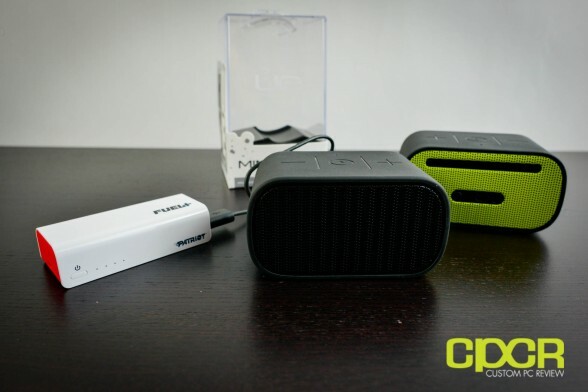 While I’d probably go with something like a Creative Sound Blaster Axx for home or computer use, I think the UE MINI BOOM is a perfect travel companion. It’s small enough to fit into a backpack, purse, or carry-on luggage, it has a decent battery life, and the sound is just powerful enough for a small group setting. 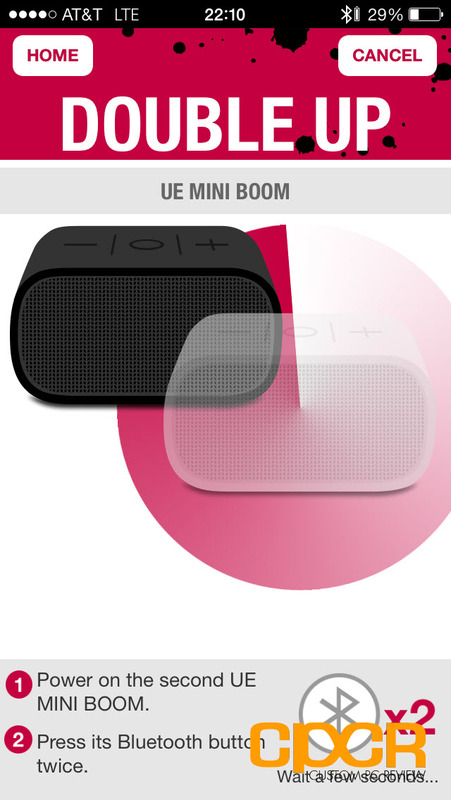 If that’s exactly what you’re looking for, then I’d definitely take a good hard look at the UE MINI BOOM. This is a late comment but I just found out about these speakers now and with the pricetag it’s tempting to buy two of these. That said, I wanna know if I can pair 2-3 phones or devices (a laptop perhaps so I have wireless stereo sound) to it at the same time so we can take turns playing music without one disconnecting first so the other can play music? And if there’s sound coming out at the back of the speaker too other than just bass or subwoofer? Lastly, how do I find out how much battery is left? Is there a voiceover prompt after pressing together some buttons like its big brothers the Boom 2 and Megaboom speakers?